I’ve done some detailed presentations on the flooding situation happen in South Galway and the good news is that for the majority of the areas affected by flooding there are solutions – they are not rocket science. It’s time to have an overview of the key solutions available. I will try and document these in detail in the coming weeks but here is a summary of the main solution approaches. There are well documented cases about slowing the flow coming down from mountain. In English towns such as Pickering they formed a committee and ran a project called ‘Slow the flow at Pickering’ and used a range of land management measures to help slow the rush of water. A lot of this is to bring back some of the more natural drainage to the mountains. This means that there is a potential solution to be able to divert some of the Ownshree into the Aggard. This solution has been details in an OPW report Termon Mannin Kilchreest Final Report 231210. This solution is feasible, but only on the back of delivering an improved drainage scheme on the Dunkellin river [Subject to approval on 29th-Feb-2016]. Alleviating some of the flow from the Owenshree river would lessen the build up of water on Castledaly, Grannagh and Blackrock and be an overall benefit on the whole South Galway flooding. Does this swallow hole still exist? This needs more investigation. In general it is essential to ensure that the swallow-holes throughout the system are in good condition and can keep the water flowing. 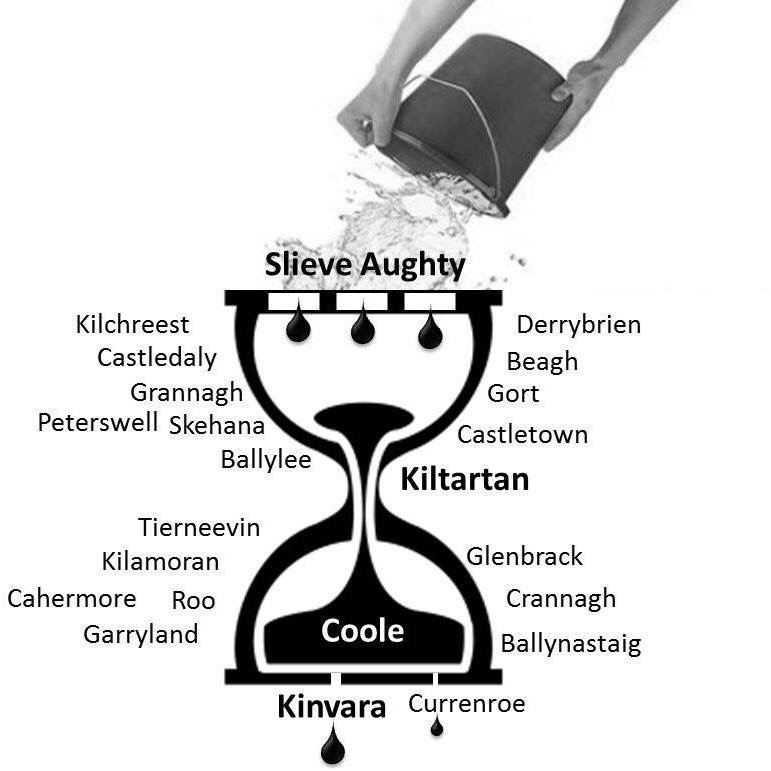 As detailed before, Kiltartan is the pinch point in the Slieve Aughty drainage. All flows must go through Kiltartan. The water needs to be able to flow freely through Kiltartan and into the Coole Basin. Keep the level of Coole Lake down – If Coole Lake rises then the swallow-hole at Kiltartan will not be as efficient and will result in an overflow across Corker. A properly managed Kiltartan-Corker overflow. Alternate overflow channel beneath Coole Ridge, again, under the new M18 motorway. Areas such as Skehana, Rinrush will also need to have well managed overflow paths. Coole lake level probably has the biggest impact on flooding in the South Galway area. Its levels have an indirect affect on the levels in Kiltartan and consequently the majority of the underground river system. Its levels also have a direct impact on the neighboring communities including Raheen, Glenbrack, Roo, Tierneevin, Garryland, Ballynastaig, Caherguassuan and Cahermore. The key in minimizing the tremendous amount of flood damage that current Coole lake levels cause, is in the the lowering of Coole lake maximum levels. As Coole lake fills, Kiltartan levels will raise as the swallow-hole pressure drops and this impacts Ballylee etc also. Also note, that the blocking point to the sea is not the level of Coole lake but the level of Caherglassaun. This lake needs to raise very high before it overflows into Cahermore, so consequently if you want to control the level of Coole Lake, you need to control the level of Caherglassaun. The follow on from that is that you then need to ensure Cahermore has a path to the sea. The temporary river channel that was dug from Cahermore to Caherawoneen was a very good example of allowing the water to flow and reducing the peak flood levels in Cahermore. A more permanent solution is currently being looked at to create a proper overflow channel. These solutions should complement each other to reduce flooding affects in South Galway. If Coole lake levels can be kept down this will allow water to flow more freely through the system but if we can ‘Slow the Flow’ and divert some of the rapid-runoff the Slieve Aughty Mountains then this will reduce the overall peak volume of water in the system. We also have to manage areas where water dynamics will lead to significant overflows in areas like Skehana, Rinrush and Kiltartan. Yes David, the swallow hole at Grannagh exists It was cleaned late 2014 and seemed to be working very well until the December 2015. The Owenshree disappears into the Blackrock turlough as it leaves Bullanagh This is a very accurate report Please keep up your good work. I trust that the OPW are taking note of your work and respond accordingly.